The feast day attributed to St. Blaise is February 3rd. It is the tradition on this day, to bless throats with blessed candles as the intercession and protection of St. Blaise is called upon. 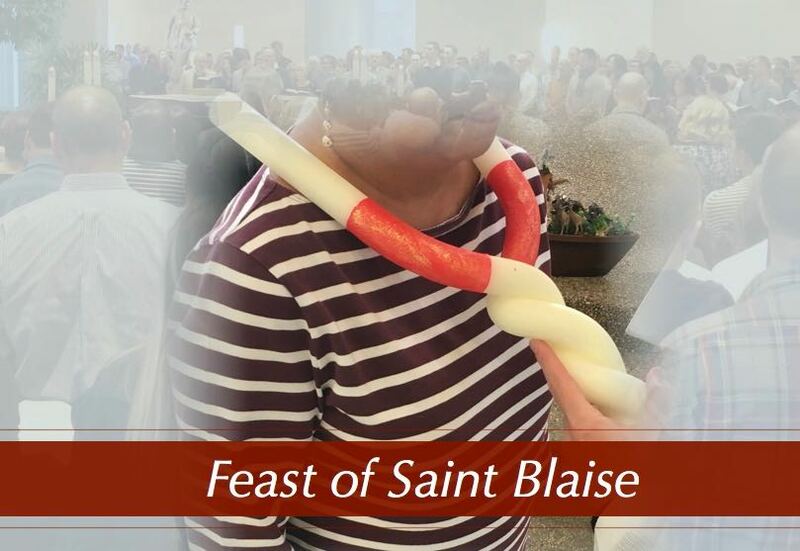 Though the feast of St. Blaise occurs on a Sunday and is therefore muted by the celebration of the Sunday liturgy, at the conclusion of the Sunday Masses, the traditional blessing of throats will be offered. Saint Blaise was the bishop of Sebastea and a doctor. The first known record of the saint’s life comes from the medical writings of Aëtius Amidenus, where he is recorded as helping patients suffering from objects stuck in their throat. In 316 A.D., the governor of Cappadocia and of Lesser Armenia, Agricola, arrested then-bishop Blaise for being a Christian. On their way to the jail, a woman set her only son, who was chocking to death on a fish bone, at his feet. Blaise cured the child, and though Agricola was amazed, he could not get Blaise to renounce his faith. Therefore, Agricola beat Blaise with a stick and tore at his flesh with iron combs before beheading him.